Whats F1 and its debate without the great one? Hopefully this is a valid thread. Will Michael's good feeling about the car translate into race wins? A new forum a new hope for Schumi fans. Go Schumi!!!! Go Schumiiiiiiiiiiiiiii! You heard it first here guys. WDC 2012!!! Ok on topic, what chances do we think the great one has this season. Honestly. I'm seeing the start of a push for next season for him. 2011. Rubbish car. But more consistent that 2010. More points and some great drives. 2012. Car is improving seems to be up the sharp end after the 2nd test. Should challenge for the podium. 2013. 1 last push for the title i think before retireing again in readyness for the new rules in 2014. 2000-4 is 2013 with a front running championship car. 2013 seems to be a possibility with some noises about renewing Michaels contract doing the rounds, his comeback has ruined his statistics for sure so no hurt in trying one more year, gives fans like me a reason to watch F1 with some interest. After all everyone needs a favorite in any sport to follow it with excitement. On longer runs, front tyres wear is quite big. Tyre wear, heating issues, seems like its 2010, 2011 all over. michael is alot more consistent with tyre management.. His longer runs at barcelona seemed to show that. Consistent 1'23-1'24's on 18 lap stints. I'm not sure about red bull or mclarens tyre management. Didn't button only do 1'25's. Could that be because of their new "F-duct" brings more downforce to the front tires? But by the time the car hit the track the bodywork had been modified to feature sections coated with a ceramic thermal barrier, but despite this the car quickly showed signs of getting too hot, with scorch marks burning through the silver stickers. This could be a re-occurence of the overheating problems suffered by the W02 at this time a year ago. It would be good news if W03 had so much downforce. That would really help them challenge Red Bull. "We did a lot of setup and detail, there were also some things that were no better, we have made mechanical changes to the tires on the distance to bring. the front tires break down very quickly. We wanted to improve, but it has not changed. " I just hope this year he'll step on the first step of the podium again. 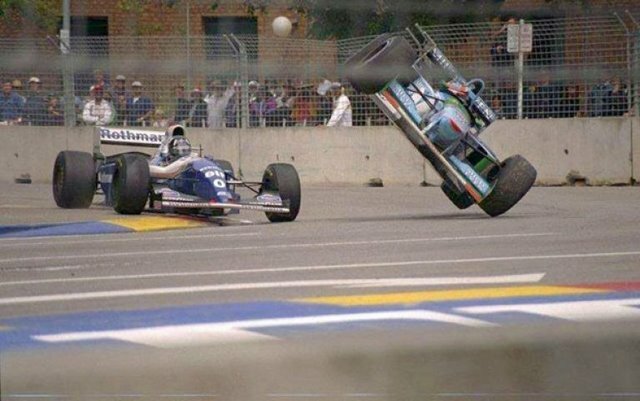 Wonder there was nothing from Schumi on this issue. W03 more suited to Schumi? I would like to publically thank Schumacher for providing me with 2 years of merriment and laughs. Mercedes AMG doesnt see it that way. The "old horse" is still value for money, and his records stay no matter how much you laugh. Michael showed enough talent last season to show he still has something. If HE gets a half decent car, he will be on the podium. And the fans will take that for now. Thr Mercedes will be a step closer to the bulls and Dont be surprised if they are racing against and beating Mclaren. Personally, I can't see Schumi getting another WDC I think that he's just a bit too old now, (being 43) and I can't see him winning in a straight out fight with some of the younger drivers on the grid (Vettel, Hamilton, Alonso). That doesn't mean that it won't happen though..
Well said that man. Having Schumi back is just fantastic and F1 fans whatever their feelings on him should realise he makes F1 just plain better. First post on the new forums, looking nice! Anyway, I hope Michael can get some great finishes this year, hopefully Mercedes have something up their sleeve. Not to forget Hakkinen, Coulthard, Montoya and so on. To hell with the people who always moan Michael did not have a fair opposition.